About a month or two ago I got an inquiry from a wonderful twitter friend of mine about designing a tile with her mother-in-law in mind. 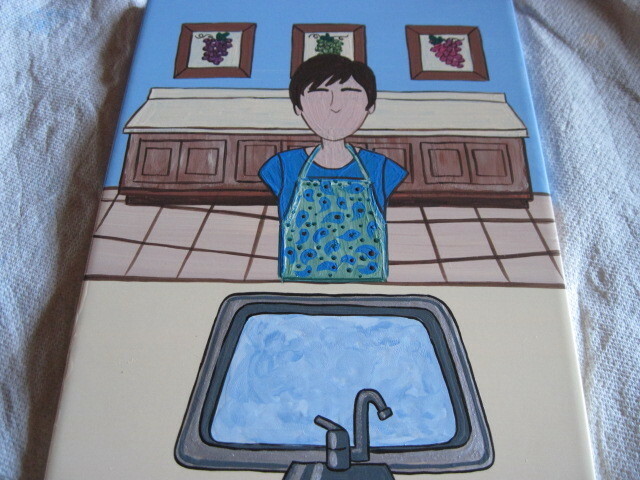 She was interested in giving it to her as a Christmas gift this year and would I be able to paint one for her adding in any or all of the following elements: Her (mother-in-law’s) kitchen is decorated with a wine theme. She is always in her kitchen doing the dishes or cooking. She always wears yellow plastic gloves when she washes dishes and she always wears her apron. 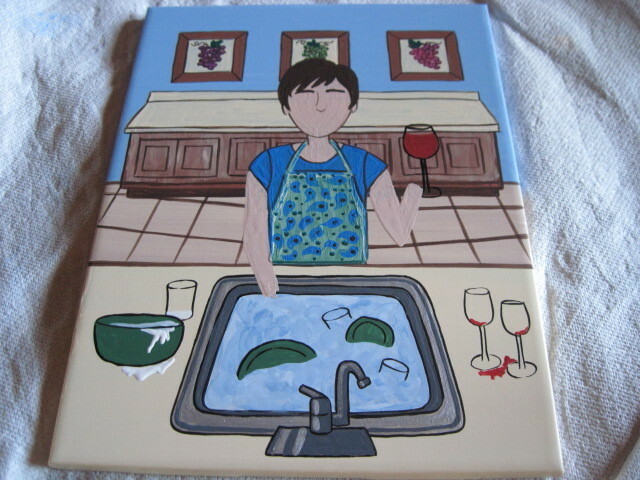 Maybe I could paint her holding a glass of wine too and could I add the words “Nena’s Kitchen” into the mix somewhere? Could it be done? Oh, and she attached a photo to her email so I could get a better idea of what her mother-in-law looked like. I emailed back with my quote. Time passed and I assumed that they had decided to go another direction for this year’s holiday gift. Then, one day, I received an email saying they’d like to proceed with the order. My friend had been persistent with her husband regarding my tiles and had made sure he was aware of the work I’d done in the past for other clients by visiting my portfolio pages. Sweet! Well, it’s a start. Let’s see, what should come next? Oh, I’ve got it…. Huh? What the heck it that? Oh, now I get it. 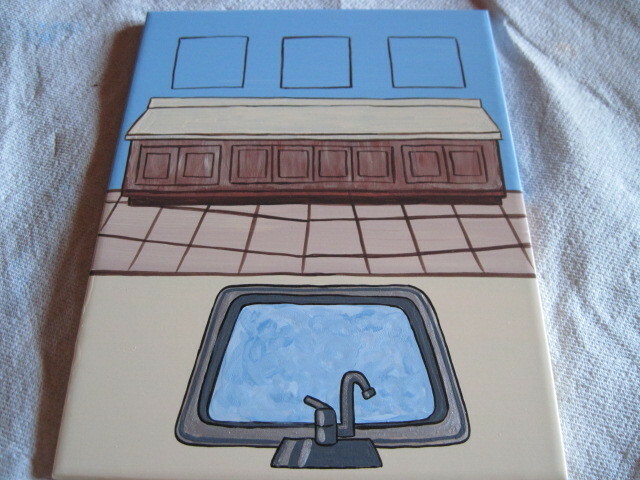 It’s JUST the kitchen sink. Seems a little backwards if you ask me 🙂 Hang on, we’ll get there. Whew, it’s starting to look more and more like a kitchen and I’m starting to feel a tiny bit more relaxed! 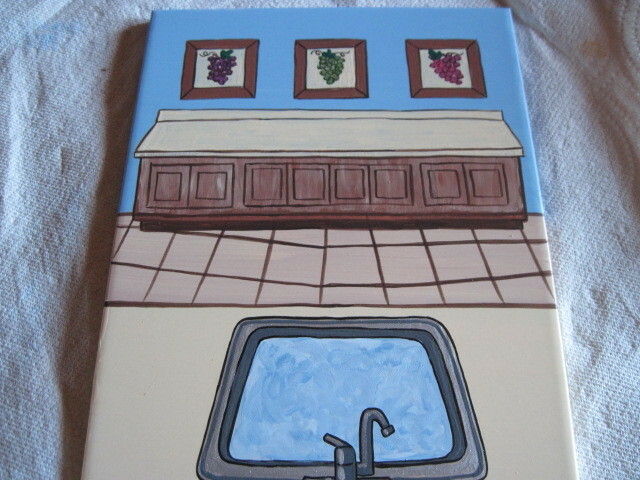 Here’s my brainstorm for making her kitchen have a wine theme. I think it was a good one (if I do say so myself). There, that’s better. Look, she even has a big smile on her face now and her eyes sparkle! Someone has even taken the time to stage the back counter with snacks for the company. Awesome! She is quite the hostess! And here we have the inspiration for the tile. I wish I could see the look on her face when she opens this gift! 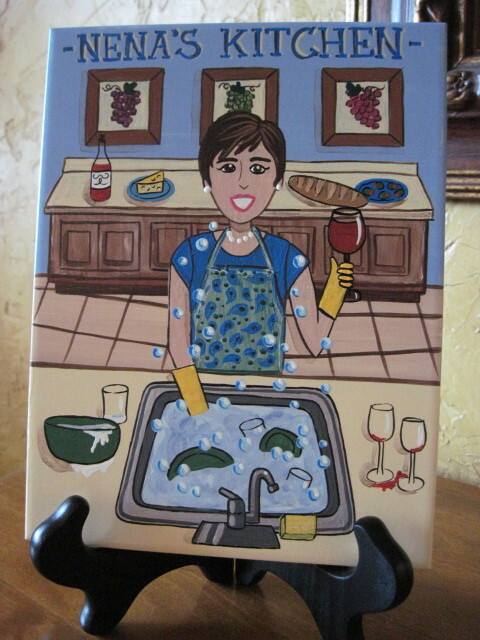 The party was a huge success and this hostess with the most’ess is enjoying her glass of wine amongst all the bubbles in her sink and a good time was had by all…. FFWD Pumpkin Gorgonzola Flans - Oh My! Love the bubbles. You really are good at this. Wow, what a lot of detail on this one! Great job, as usual–it's beautiful! That is awesome, Renée! Just perfect! Who wouldn't be proud to give that to their mom? How cute! 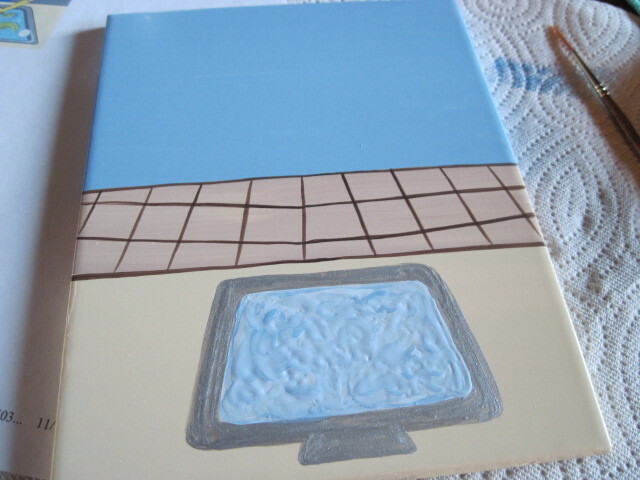 Can't wait to order my tile and see what you come up with! Renee~ I must tell you that EVERY time I see the picture of this tile it brings tears to my eyes. I cannot believe how absolutely amazing it is! 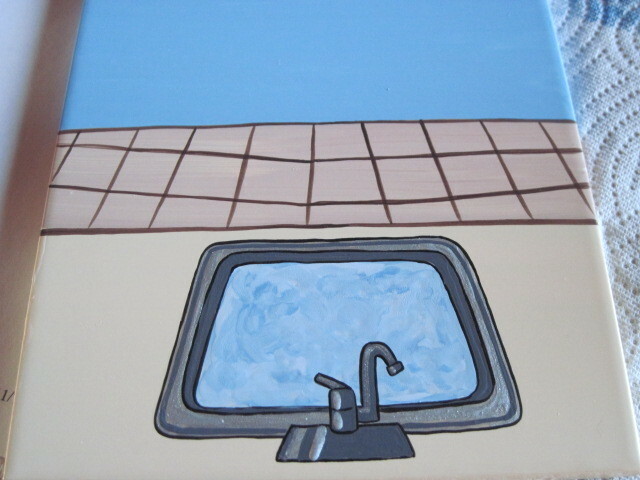 I mean, I know you do outstanding work…but I never thought it was THIS amazing until you made my special custom tile. I'm so glad it was a tad challenging for you (every great project is right??) and that you are proud of your creation. 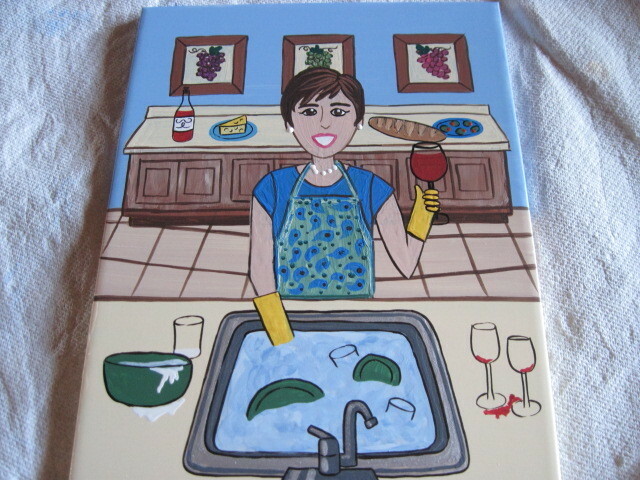 I plan on taking a picture of my mother-in-law when she gets the tile since I'll be able to give it to her in person this year. I will definitely share the picture and her thoughts with you when I get them. And, for the record, when I showed The Hubble the completed tile he got the hugest grin on his face and said "that's pretty cool." And that boy does NOT give compliments easily! Thank you SO much for all the work and love that went into the project. It was definitely worth EVERY penny!!! You are amazing!!!! The look on her face will be shear and utter delight. I know the look, it was on Ella's face when she opened her butterfly tile! 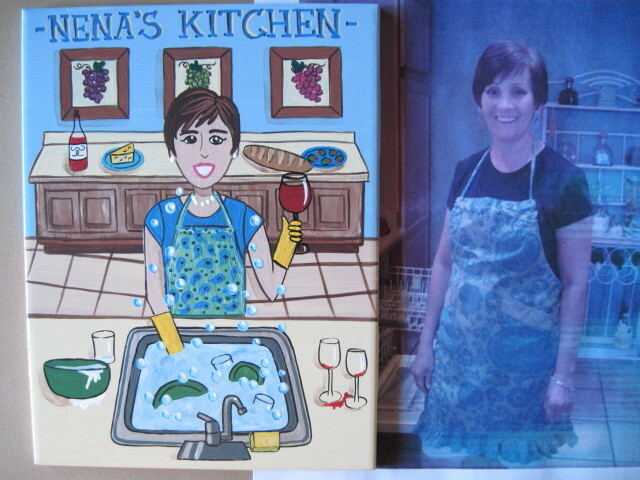 This is a beautiful personalized gift Renee. This is really amazing. My sister was so thrilled with your work that she sent me this link so I could see how amazing it is. I know Nena and I can just imagine the look on her face when she gets it. And Maranda is right the Hubble is hard to please. This is amazing and I know Nena will love it! Thank you all so very much!! You are so thoughtful to take the time to write to me. 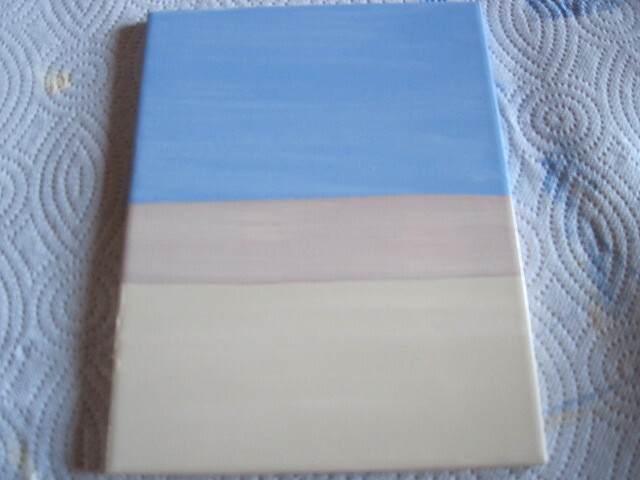 I appreciate it and enjoying showing you how I make such fun tiles for such wonderful people. Hey Renee!! Thanks for visiting my blog today!! I LOVE your artwork- you are so talented!! Can't wait to read more posts!! I'm signing up to follow you. Have a geat night! This is fantastic Renee, I love it! This is fabulous! You are so, so talented! 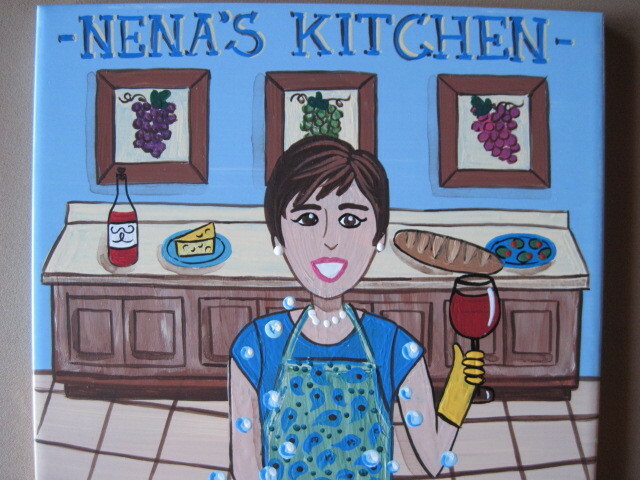 I love how you captured Nena on a tile…a masterpiece Renee! Fabulously done!! That is so amazing – you did such a good job! !